Find out the steps needed to add Aerodactyl to your PokéDex in Pokémon: Let's Go. In Pokémon: Let’s Go, players have been asking where to get Aerodactyl. Unlike Pokémon you can find and catch in the wild, the best way to get Aerodactyl is by finding a sample of Old Amber and taking it to the Lab on Cinnabar Island for analysis. After that, you’ll get a free Aerodactyl, no Poké Balls required. Want to know where to get the Old Amber that unlocks Aerodactyl in Pokémon: Let’s Go? We’ve got you covered! Below, we’ve put together a quick guide on where to get Aerodactyl in Pokémon: Let’s Go! To get Aerodactyl, you'll first need to pick up a sample of Old Amber from the Pewter Museum of Science in Pokemon: Let's Go. As stated above, the best way to get Aerodactyl in Pokémon: Let’s Go is picking up a sample of Old Amber. This sample can be found near the museum in Pewter City. To collect it, head to Pewter City and rather than using the main entrance to access the Pewter Museum of Science, head right and around. There, you’ll find a small tree that can be cut using a Secret Technique called Chop Down. For more on how to unlock Secret Techniques like Chop Down, be sure to check out our previous guide. Once you’ve cleared the tree out of the way, you can enter the Pewter Museum of Science. Interact with the scientists inside, and one will give you a sample of Old Amber. With the Old Amber acquired, head outside and make your way over to Cinnabar Island. If you’ve unlocked the Secret Technique called Sky Dash, you can quickly fly over to Cinnabar. When you land, head left from the Poké Center until you find the Cinnabar Lab. 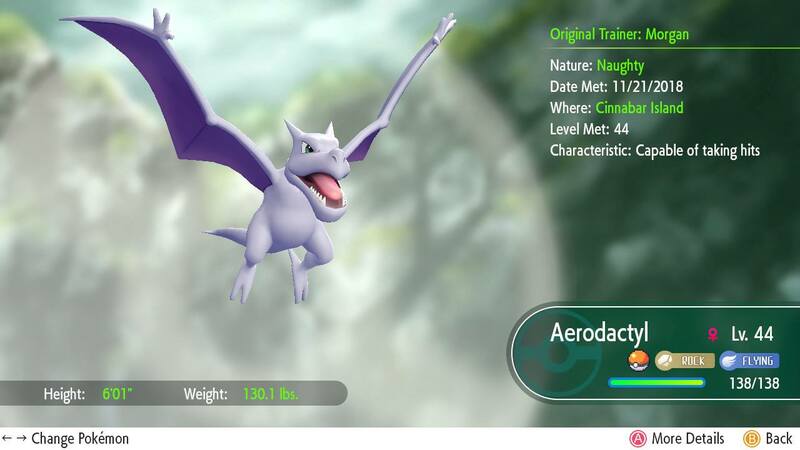 In addition to the Old Amber sample, you can also transfer Aerodactyl into the game using the GO Park Complex in Pokemon: Let's Go. Enter the Cinnabar Lab, then take a right and make your way down the long hallway. When you come to the last door, enter and talk to the scientist in the upper right corner. 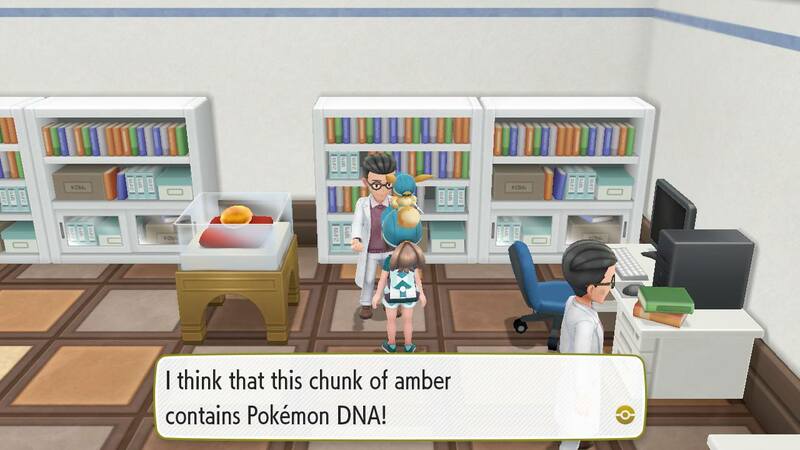 By talking to this scientist, he’ll be able to analyze the Old Amber, then use his machines to bring Aerodactyl back to life. After that, you’re given the Aerodactyl and can add it to your PokéDex and Party in Pokémon: Let’s Go. Alternatively, if you’ve caught an Aerodactyl in Pokémon GO, you can transfer that Aerodactyl into the game using the GO Park Complex. With that done, it’s just a matter of catching the Aerodactyl again in the GO Park. So, were you able to get Aerodactyl in Pokémon: Let’s Go? If so, what do you think of the Pokémon? Let us know down in the comments below! For more on Pokémon: Let’s Go, be sure to check out some of our previous guides including how to get Mewtwo in Pokémon: Let’s Go, where to get Dratini in Pokémon: Let’s Go, and where to get all Outfit Sets in Pokémon: Let’s Go. By reading through this guide, you should now know where to get Aerodactyl in Pokémon: Let’s Go.